That’s EXACTLY what I’m talking about!!!! Bravo on this one! Would be cool to build this in sections, like a compound house. How much do you think this structure would cost to actually build (including energy, water, etc)? Maybe without the moat =). You have to do a careful cost estimate based on local prices. Material prices, building codes, labor, etc. all dramatically affect the cost. So then, how would one go about constructing this? I live in Arizona and will be building a home soon (By I, I mean me and maybe some friends). I hope to build in the Santan Valley; a very flat, dry, empty area. Find an area with few or no building codes or the cost may very well be prohibitive. Codes make it almost impossible to build affordably. If I wanted to build this or the Dome Fort in an area like east Texas, which apparently has pretty high humidity year round (I have just started looking at land there), would that be a problem? I have been thinking of the Dome Fort, only without the dome cluster – instead, with the three roundhouse design, and using greenhouses instead of the walkways as in the two roundhouse with greenhouse design. 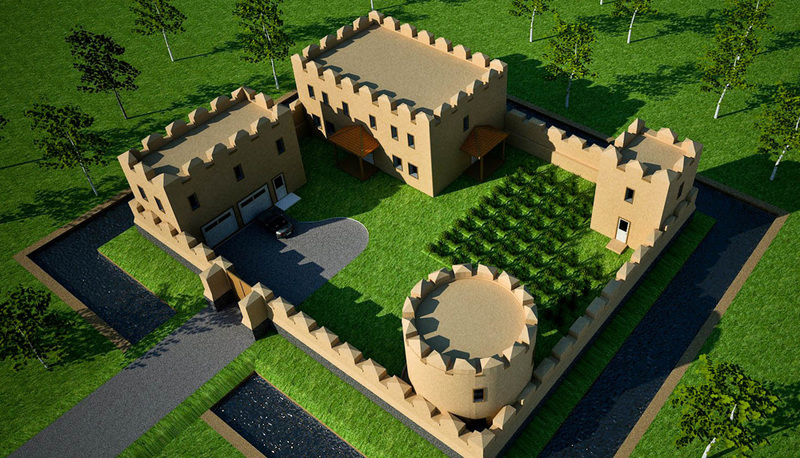 I was also thinking of spreading it out over a larger footprint to give me more room for a chicken coop and gardens inside the walls – but no moat, and I would probably not build the walls quite so high. I will definitely be doing it a little bit at a time – starting with just one of the roundhouses! Start with something small so you can learn the basic skills. Then build the house or other important structures before building the wall. The wall is a lot of work and not nearly as important as a home. No problem with earthbag building in rainy climates. Sand bags are designed for flood control and can last 500 years according to the US highway department if kept out of sunlight. Sorry, only saw the first part of your reply before I replied – I guess that is a bad thing about smart phones… I won’t worry about the rain. A shed is probably the best starter project. It’s almost impossible to screw up, costs almost nothing and is great for storing tools and supplies. It’s best to have some help. Earthbag is very labor intensive. Consider putting a big tarp over the top of everything so you can work in the shade. Don’t get discouraged. It gets easier over time as you toughen up. Keep the bags out of the sun. Coat the bags with old paint, etc. if necessary. No matter the type of building, it’s best to have a roof to protect the walls. The rainier the climate, the larger the roof overhang. People are building earthbag homes in rain forests and other tropical places. You won’t have a problem if you use good design: raise the building site or build on high ground, use gravel bag foundations and rubble trench, slope the ground away from the building, put windows on all sides for cross ventilation, use large roof overhangs (4′ or so) to shade the structure and keep rain away from the building. Thanks – I have been sketching out ideas and making lists of what I want (high ceilings definitely, in Texas), and when I get the property bought I will e-mail you about doing a custom plan for me. I am amazed at the variety of climates in Texas – I have looked down by el Paso and in northwest Texas and now northeast – I had no idea there was timber land in Texas. All of the acreage I have looked at is completely full of trees, which I love because I can use what I remove as part of the house and a heating source. I was going to send you my ideas now, but they have changed three times for the three different areas I have looked at! I should wait until I have it bought and know for certain where I will build. So I have admired these plans for a while now, and it has haunted both mine and my wife’s dreams. we have always wanted to build and live in our own keep. But the idea of making this completely out of earth-bags has troubled me. I however had an idea hit me the other day and I just couldn’t shake it.. What if you used two 40’x 8’x 9’6″Shipping containers per level, then take said containers and square them up by i beam and rebar frame. With in those frames use your earth-bags for the remaining say 45′ length of your walls. This allows you to easily add concrete floors on every lever and even allows you to square up walls and build even higher. I would also sue earth-bags as arch way construction and center pillars ( just like real castles were built). of course on the outside you could easily gather your own stone or veneers and make it truly look like a medieval castle keep. The cost of 4 containers would of course raise your building cost as would the i beam and rebar welding, however the benefits justify the cost in my opinion. We are estimating for the project at current price it would cost us roughly 75k to 90k for the main house and outer wall. this includes alt power and septic system. This does not include land of course nor the price of contractor and concrete base. What do you think. For us it gives us a 6000 sq ft home for far less than a stick built home of lessor sq ft would be. We are not going for a mortgage, we have been saving for nine years and in another two years think we will be able to start the project. Not sure of the details, but in general you can combine earthbags with shipping containers. The biggest factor is labor. We always suggest starting with something small like a tool shed so you can develop your skills. Fantastic work and contribution to society you have made available; thank you! Thanks, Ras. That’s the best email/comment of the day. Approximately how many bags to build such a castle? Sorry, I don’t do take offs unless hired to do so. I would like to know what the price of a full set of building plans is and if you would be interested in discussing a couple of additions. I would like to add a shop at least as big as the carriage house and a keep of some sort to be an ultimate safe house accessible only from the second story of the chonburi house by draw bridge to a balcony on the house. I’m too busy now to do custom plans. You can order the CAD files and have a local designer modify them. Thanks, and I might be able to figure the modifications myself. I do not find the plans at the web address provided, are these plans available for purchase? Only the most popular plans are listed at Dream Green Homes.com. Write Kelly and he will explain how to order. Go to Dream Green Homes.com. Not all plans are listed. Write Kelly and tell him which plan you want. Wanting to build the castle in eastern New Mexico. Want to leave the plans how you have them. What would be the cost of the plans. I have 5 acres to build on. Plans are available through Dream Green Homes.com. Email Kelly if you don’t see the plan you want. About how much would the plans cost for the castle and do you know if one based on your plans has been constructed. Me and 3-5 friends are thinking of building this in Vermont or New Hampshire as an off grid comunity would this work well with the weathe conditions in the north east. The castle is $500. However, this is for dry areas with low rainfall. Add proper roofs in your area to protect the walls. You can get free bids from truss manufacturers. It is hard to estimates costs because there are so many variables. If you scrounged and did all of the work yourself you might get by for about $25,000, but a more likely sum would be more like $60,000 or more.